Justin A. DeVault helps clients plan for the future through the use of estate planning. By working closely with clients throughout the various stages of their lives, he is able to help them protect their assets and preserve wealth for future generations. Justin works with individuals and families to develop carefully crafted estate plans tailored to each client’s individual needs. He utilizes planning devices such as Last Wills and Testaments, Revocable and Irrevocable Trusts, Financial Powers of Attorney, Health Care Powers of Attorney and Living Will Declarations. 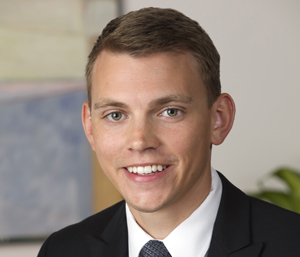 In addition to estate planning, Justin also navigates fiduciaries through all aspects of the estate and trust administration processes. This often includes the preparation of probate filings, resolution of estate and trust disputes, and the preparation of federal and state estate tax returns. Justin’s methodical and thorough approach to these matters allows him to provide comfort to his clients during this difficult time, relieving much of the emotional burden that follows the death of a loved one. In the legal community, Justin is a member of the Montgomery County Bar Association and Maryland State Bar Association. He also serves as co-chair of the Young Professional Advisory Committee of the Greater Washington Community Foundation.